On a sunny Saturday afternoon at the South Lansing Capitol District Library, Dr. John Aerni-Flessner stood in front of a packed room of Lansing community members. The MSU Residential College for the Arts and Humanities (RCAH) assistant professor was there to present the early findings from a research project he took on with his students to uncover the history of displacement and redlining in Lansing. His talk, “Redlining, I-496, and Lansing’s African-American Community,” explored the intersection of redlining practices in Lansing and the I-496 urban renewal projects that took place from 1963-67 that bisected the vibrant African-American community located in the Southwest capitol area. Through interviews with former residents of the area, hours of time in the archives at the Capital Area Libraries looking at old property deeds and a mapping project, Aerni-Flessner and his students were able to begin documenting the history of the once vibrant community and the devastation the came from uprooting an entire section of the city. Pictured above is a screen shot of the interactive map highlighting redlining in Lansing. Click the image for the full interactive map. Aerni-Flessner explained that the history of redlining, a federal policy whereby communities were split into zones based on which areas could get federal mortgage backing and which could not, in Lansing is a distinctive case. 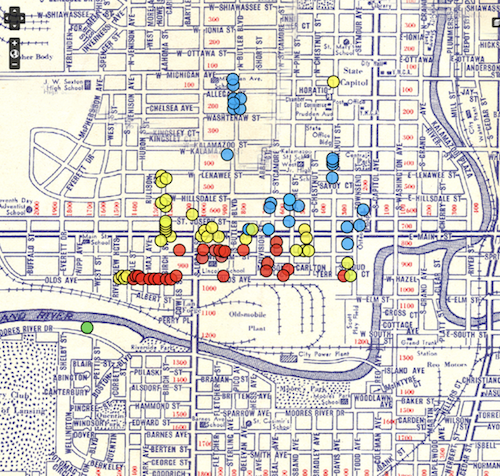 According to Lansing redlining maps, the areas of the city that were marked red were very close, even sometimes next to, the areas with the highest ratings of blue or green, unlike redlining in Detroit where there are large sections of areas distinct from one another and located far apart. This means that redlining in Lansing occured at the micro-level with blocks and streets being redlined instead of entire sections of the city. Direct evidence of how redlining and segregation manifested in Lansing can be seen in the restrictive covenants, clauses located in the deed of a house stating who can purchase the property and who cannot, written into property deeds. Many of the deeds located in the area allowed people of color to purchase the property, while other houses just a block or two away only allowed whites to purchase or rent. Many of these covenants are still written into the deeds today, although the enforceability of them was made illegal by the supreme court in the 1948 landmark case Shelley vs. Kraemer. Even though the enforcement of restrictive covenants was outlawed in 1948, the practice of shutting out people of color from the traditional housing market continued on long past. In Lansing, this was done by artificially inflating the prices of homes once they were open to everyone. This barred people of color out of the traditional mortgage market and forced them to buy property on-contract. Buying a home on-contract is a form of speculative home purchasing where a buyer takes on all responsibilities of home ownership and pays a monthly fee every month without building equity on the home until the cost of the property is paid off. These practices meant that, in Lansing, African-Americans were segregated into separate communities at the street and block level. They were often paying more for housing and many of them were living in a home on-contract. Though in segregated areas, black communities in Lansing were prosperous with many churches and black-owned businesses within walking distance to homes where neighbors would gather and community relationships were rooted. All of that changed when the urban renewal projects were announced in 1963. The plan was to build a highway that stretched across Lansing that would make commutes easier and incentivize more people to move to the city. Unsurprisingly, the city of Lansing chose to build the highways through the communities with the least amount of political defense against forced displacement in the name of progress. Although, Aerni-Flessner did note that bankers and realtors were initially worried that the uprooting of Black communities would lead to integration and result in mass protests from Whites. Residents interviewed by Aerni-Flessner and his students described the immediate implementation of the highway projects as being quick and as having little choice in the process. Many residents described an appraiser appearing at their door one day telling them what their house was worth, how much they could get for it, and not to bother fighting it because fighting city hall would be a losing battle. The project was carried out with no plan to help the people being affected, and offered no relocation assistance until 1967. Residents who owned their homes received 25% of its value up front and eventually got the entire payment later from the $15.6 million of the project funds allocated to property acquisitions. Renters or those who bought their house on-contract got absolutely nothing to relocate because they were not formal property owners. Aerni-Flessner’s talk is a reminder that all of this had real human consequences and that the people involved are still living with them today. It also served as a demonstration of the power and persistence of communities and the impact of community storytelling. Throughout the discussion, individuals attending the event would shout out when they recognized a place that was mentioned. The places destroyed by the project still live on in the hearts and minds of the individuals rooted there. Oral historians waited outside of the room to collect their stories as a part of a project in Lansing called Paving the Way, a project that seeks to document the history of those affected by using oral history to collect their stories. Aerni-Flessner and his student’s work is a part of this project to preserve the memories of the lost neighborhoods.